One of my many regrets is that I only became a bona-fide tea drinker since leaving Japan. I have always enjoyed iced tea and will take it over just about any other drink. Imagine my glee when I arrived in Osaka and found that iced tea was available in multiple varieties. Everywhere. It was a happy discovery. I swore the first time I walked into a Lawson, just outside of the Keio Plaza Hotel in Shinjuku, that I was never leaving this country. At the time, I favoured (iced) milk tea, iced and sweetened matcha, and really any kind of iced tea that crossed my path. I've frequently drank Tazo Passion tea ever since I spent a year working next door to a Starbucks, and I have always enjoyed black teas in general, but it wasn't until recently that I began to really drink and enjoy loose-leaf brewed and hot green tea. I've never been a big fan of hot drinks, and I've preferred my tea sweetened - which green almost never is in Japan, unless it is the kind of iced matcha you buy from a fountain dispenser! For a time, trying to get used to the taste and enjoy it, I was drinking Lipton green tea made from teabags and sweetened with honey (sacrilege!). Recently, though, I have begun collecting loose green teas and brewing them myself, to help me get refined sugar out of my diet. I enjoy my English tea with cream and sugar, so a switch to green seemed like the best approach to have my daily tea without the daily sugar cubes. A friend gave me loose hojicha and genmaicha for my birthday, my roommate and best friend gave me a beautiful teapot for Christmas, and I recently invested in some quality tea strainers (the ball-shaped tea infusers are no good for green - the leaves can't 'breathe' enough!) that fit into the teapot. My mother just gave me a set of Japanese-style miniature cups as well - so now I've been nursing this pot of pre-strained hojicha for the last three hours, as it sits on its little ceramic teapot-warmer. Nice! I've been learning about brewing green tea, in the meantime. Did you know that the leaves will burn if you try to brew them in boiling water? That's where the bitter taste typically comes from. You should brew green tea in water that's ideally 85 degrees Celsius. After you boil your water (you want to boil the chlorine out of it), let it sit for a few minutes to cool to the right temperature. Or you can use a programmable pot or kettle to bring it down to 85 for you - right now, I own an electric pot of a style that's very popular in Japan. We kept a very nice one in the English department, and on those infrequent winter days when I did feel like a hot chocolate or a strawberry latte was in order, the hot water was always ready to go. 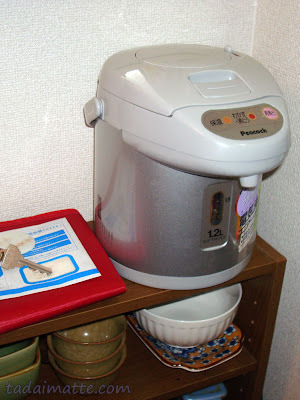 I picked up my Panasonic electric pot for about ¥3500, or $40. Overseas models will cost you twice that. This one was bottom-line and has no temperature gauge or electric dispenser. Now I own a fancier one that has settings for black tea, green tea and baby bottle milk. (Handy for new parents - useless to me!) The insulated pot keeps it at that exact temperature for you at all times. I rarely used my Panasonic pot pictured above, though I bought it to encourage myself to drink more tea. Now, I use the one I have, every single day. I lucked into it on Kijiji one day as I was searching for Japanese house furnishings. A university student here was moving out of his dorm and looking to sell his pot on Kijiji for $25. There was no instruction manual and all the buttons were in Japanese, so I guess he figured it wouldn't sell, even though the overseas models of these things will run you $110 or more here in Toronto. I snapped it up; downloaded the English version of the manual online, cleaned it carefully with vinegar and baking soda. Works like a charm and so useful. The thing I haven't quite gotten the hang of is finding green teas that I really like, as opposed to just drinking because they are sugar-free. That changed when I received a packet of quality hojicha for my birthday. Love this stuff! It's a nice, mellow taste. The genmaicha I got is also fantastic. I think in the past when I prepared green tea, I didn't really know the proportions...I always made it way too strong and with water that was too hot, and I ended up ruining it. I always wondered why I could drink cup after cup from the local kaitenzushi restaurant, and be absolutely disgusted with my own home-brewed teas!